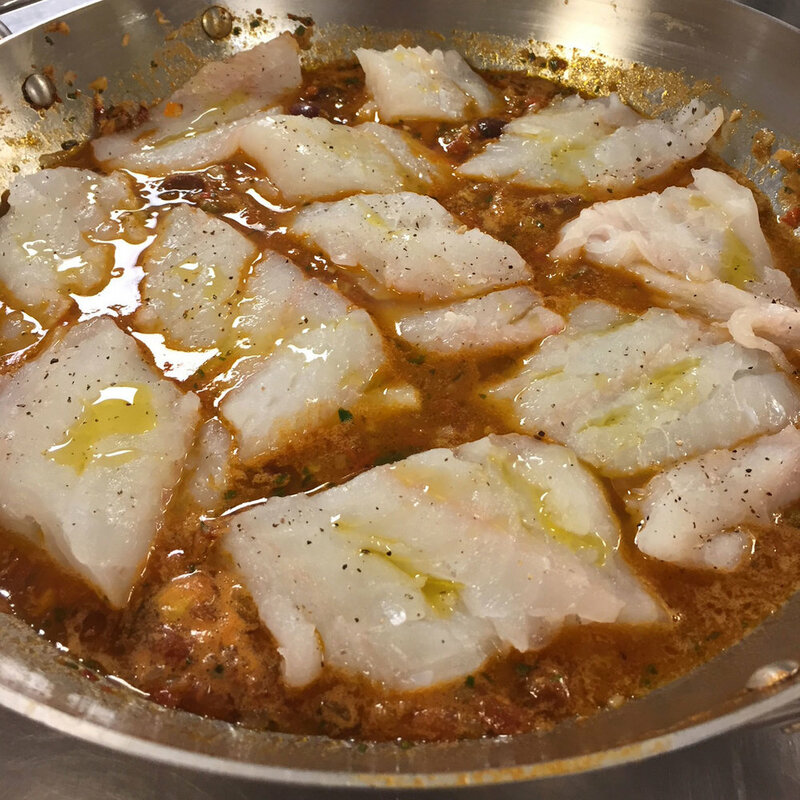 Pesce All'Acqua Pazza (Fish Poached in “Crazy Water”) — The Local Catch, Inc. - The Best Rhode Island Seafood! Using a pan wide enough to fit your fish in a single layer, sauté onion, fennel and garlic in olive oil over medium-low heat until soft and lightly browned. Add pepper flakes and anchovy paste to soffrito base and cook 1 minute. Add tomatoes, white wine, olives, capers and half of parsley. Allow the tomatoes to simmer a few minutes to soften. Place fish fillets into sauce. Add enough fish stock or water to come about halfway up the fish. Season fish and broth with salt and pepper. Bring liquid to a boil then place pan in the oven. Roast in oven for 5-15 minutes (depending on thickness of fillets). When fish is fully cooked, remove from oven, spoon some of the pan juices over fillets and sprinkle with more fresh parsley. Serve family style with warm, crusty bread.